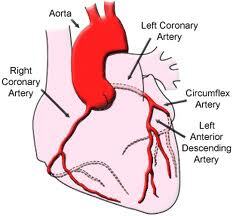 Angina pectoris or angina is a heart condition in which chest pain occurs when heart do not receive sufficient blood. Angina patient feels chest pain in case of eating disorders, extreme temperatures, physical exertion and strong emotions. The angina pain may be felt in upper back, upper arm, jaw, shoulder or in neck. Nitroglycerin can be used for the treatment of angina. Untreated angina can lead to heart attack as well. Time is an important factor in case of heart angina. If heart is deprived of blood and oxygen for more time, then there will be a serious risk of heart attack symptoms and abnormalities in heart rhythm. If chest pain continues for a longer duration, person should immediately seek a health care provider for angina pectoris treatment.